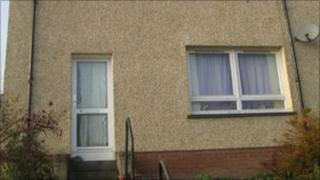 A Hawick woman has been banned from keeping pets for 10 years after a dead cat was found on her kitchen floor. Animal welfare officers made the discovery when they raided Catherine McGillivray's home over concerns her dog was being neglected. Sheriff Kevin Drummond said conditions in the house were "quite dreadful". McGillivray, 43, of Queens Drive, admitted failing to provide a clean environment and nutrition for her dog between 1 June and 24 August. Procurator fiscal Morag McLintock said one Scottish SPCA officer described the scene as "disgusting" saying it was the worst home hygiene she had ever seen. Ms McLintock said: "There was a large quantity of faeces, some covered in white mould, furniture was torn and badly soiled, and there was rubbish strewn about the place. "The dog was described as 'friendly' but its claws were overgrown, and its hip bone and ribs visible. "It also had faeces matted in its coat." Defence lawyer Rory Bannerman said his client did not oppose the move to ban her from keeping animals. "She had a lot on her plate at the time, and effectively buried her head in the sand," he said. "A lot of unpleasant things were found in the house but she says the dead cat was not hers and she doesn't know how it got in." Sheriff Kevin Drummond said the case raised serious health and welfare issues. After looking at a book of photographs illustrating the conditions inside the house he commented: "The scale of the situation here is frankly as bad as I have seen. "It is quite dreadful to see the conditions in which this dog was existing. "The fact that there was a dead cat in the house, of which you knew nothing, says everything." As well as the 10-year ban on owning or keeping animals, McGillivray was put on probation for 12 months.